In this post, I am going to cover my reasons why you should stop comparing yourself to others and what to do to stop comparing yourself to others. If you find yourself constantly looking at others’ physical appearance or possessions, don’t worry for that is a natural human instinct. However, when you start looking at others’ accomplishments or possessions and gauging your own worth in accordance with what others have that you don’t have, then you have a problem. If you think that others are wealthier, more successful, beautiful, and more accomplished than you are, then you are impeding your own contentment and happiness in the process. When you compare yourself to others, you will be in for an unfair competition. You see, there are always people who have attained more accomplishments, have more money or possessions, or are more physically endowed. Competing with such people will leave you wanting in more ways than one. It will also cause you to lose focus on your life’s goals. More importantly, it will serve to fuel your discontentment with what you have and thus lead you to feelings of unhappiness. Stop comparing yourself to others if you want to be truly happy. Constantly comparing yourself to others will only produce a vicious cycle of discontent and despondency that will leave you more dejected and miserable than ever. It is quite natural for humans to look at others’ possessions and accomplishments with longing and, to some extent, envy. However, if it gets to the point that you are already sabotaging your happiness because you feel that you are inadequate and mediocre as compared to others, then it’s time to put a stop to the comparison. Stop comparing yourself to others if you are starting to let such negative feelings rule over your thoughts and actions to the point that you are not contented anymore with what you have and you feel unhappy because of it. People who keep comparing themselves to others will find that they’re losing precious time over nothing. Instead of working on their weaknesses, such people neglect their own strengths and whatever good attributes they may have. These types of people often bypass opportunities for growth and self-development. Instead of focusing on what they have and what they could possibly do to enhance themselves, they are constantly plagued by trying to outdo other people’s accomplishments. 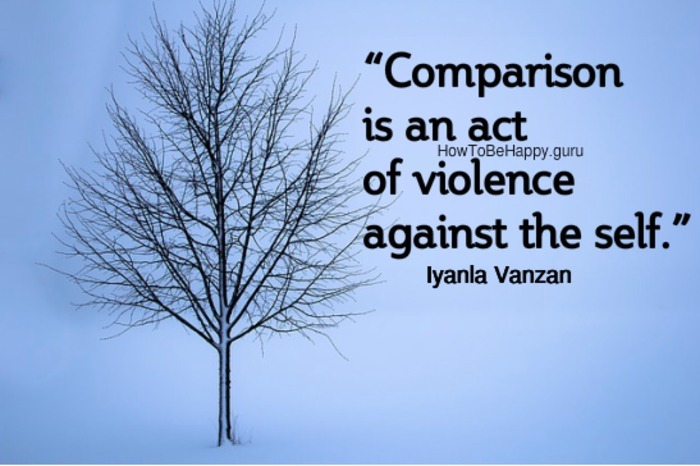 How can you stop comparing yourself to others? If you have become used to measuring your worth by competing with others, it would be difficult for you to stop the practice. Fortunately, it is not impossible. You just have to gradually condition yourself to put a stop to this negative practice of equating your value to what others have. If you find yourself thinking that someone is more successful and richer than you are, just let the thought pass. Don’t try to negate the thought by suppressing it. Allow the thought to manifest itself in your mind but do not give it much importance. Do not dwell on it and instead of getting envious of what others possess or accomplish, be appreciative of those. Just let the thought pass and fade away by focusing on how you can improve on your skills or your personality so that you can be as interesting and as desirable as you can be. You should focus on what you have instead of the things that you don’t have. People are unique. We all have our own quality that, with care and nurturing, can turn us into someone spectacularly successful and popular. If you have a particular skill, focus on it and hone it. Accept the fact that not anyone can have it all. Hence, there are those who are successful in their career but might be a failure in other areas in their lives. Stop comparing yourself to others because there are things you can do that they can’t and vice-versa. Capitalize on your strengths to equate whatever are your weaknesses. People who are not contented with what they have and are often looking at others’ possessions or accomplishments with longing or envy are the ones who do not feel grateful for what they have. Whatever you may have, no matter how insignificant it may seem, if you practice gratitude for its presence in your life, you will be able to learn to appreciate it. Remember: Gratitude is the key to Happiness. You might like to read some: Gratitude Quotes. Instead of focusing on material prosperity or physical magnificence, you should strive for the more important and grander things in life. Think more on how you could give more love and achieve peace of mind, humility, respect, and patience. These are the more important attributes to consider and have—much more important than wealth, fame, and success. People naturally long for what they don’t have. That is part of the mystery of human nature that has propelled us to this technological age. People keep inventing to satisfy their longing for the things they could have but don’t have. However, this is not to say that we should not be contented with what we have at the moment. If we want to live a happy life we should learn to love “enough.” Having those “extra things” in life which help make us comfortable is something for which we should all be thankful. # 7 Get to know yourself. Spend time to reflect on your values and how you really want to live your life.Meditate. Instead of comparing yourself to other people, compare yourself to how you were in the past, it helps you to realize how far you came and also it helps to keep improving yourself. We all have imperfections and even those people whom we admire and compare ourselves with may have their own imperfections which we don’t know about. Instead of focusing on our imperfections, however, we should strive to think that we all complement each other in this world. If we all have what a certain person possesses, what a boring world we would certainly have. Our imperfections make this world a challenging, enjoyable, and colorful world to live in. Instead of being envious of others, you should learn to appreciate other people’s success and accomplishments more. If you learn to appreciate them for their efforts, you will likely think of them of as competitors. If you take the time to learn how much effort and sacrifices these people have put in to attain success, then you will likely learn to appreciate them more rather than compete with them. Many people fail to see their own potentials because they are incessantly looking at other people’s achievements and possessions. Stop comparing yourself to others and be more mindful of your own skills and potentials instead. Who knows? You might possess a greater skill than what you see in others. Focus on such attributes instead of looking at what’s on the other side of the fence. You can never be successful if you constantly monitor others instead of focusing on your own capacities and attributes. Next time you find yourself comparing yourself to other people, if you can, take a walk or change your surroundings. Changing your surrounding can help to change your thinking. Here I am at the end of this post about “Why You Should Stop Comparing Yourself to Others“, I hope you found it inspirational and if you have any comments or suggestions feel free to comment below.